Thousands were evacuated and 19 people were hospitalized following an incident involving a chlorine gas leak that police say appears to be an intentional act. The Midwest FurFest released a statement on Sunday about the incident. "At around 12:45 AM on Sunday, December 7, the Hyatt Regency O'Hare received a complaint of a chemical odor on the ninth floor, "the statement read. "Following a 9-1-1 call, first responders determined that a container with a chlorine-containing chemical was broken there. At 1:10 AM the entire hotel was evacuated, first across Bryn Mawr Ave. in front of the Hyatt as per Rosemont Fire Department's standard procedures, then when it became apparent that the wait would take longer the Stephens Convention Center was opened to provide warmth and shelter to our guests." According to a Statement from the Rosemont police, the substance was consistent with powdered chlorine and the way it was released at the hotel "suggests an intentional act." The Rosemont police department is investigating Sunday's incident as a crime. 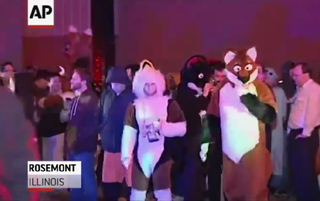 The FurFest convention celebrates "furry fandom, that is, art, literature, and performance based around anthropomorphic animals," according to their website. Nearly 4,000 people attended in 2013. "As we wake up today we want to continue to provide the best possible convention that we can, despite the trying circumstances," convention organizers said via their website. " The convention will be running on a full normal programming schedule today. We ask you to continue to be patient, and remember that the volunteers who make Midwest FurFest happen intend to give 110% to make sure that the fun, friendship, and good times of Midwest FurFest 2014 overshadow last night's unfortunate incident."